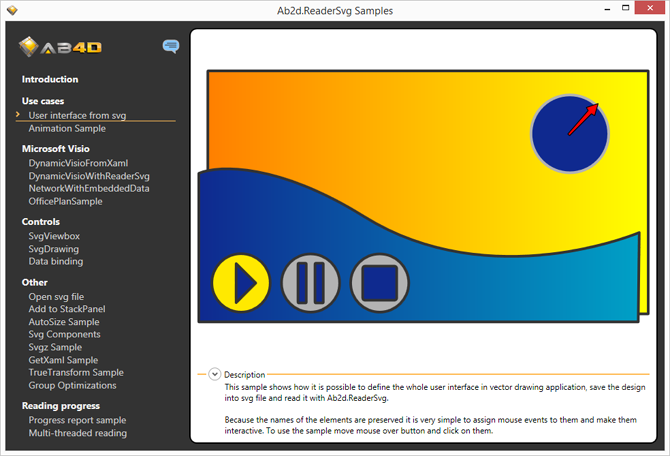 Ab2d.ReaderSvg is a class library that can be used to read svg and svgz (compressed svg) files and import its elements into any WPF application. The Ab2d.ReaderSvg can accurately read shapes defined in svg file, their strokes, fills and other properties. It can read all types of gradients, patterns and markers (line starting and ending shapes). This gives the designers free hands to define their drawings in almost any vector drawing application, save them into svg file and the application developers can than use the drawings in their WPF applications. The elements in svg file can be converted into shapes or geometry objects. The shapes (Canvas, Ellipse, Path, etc.) are great because they can be simply modified and mouse events can be assigned to them. Geometry objects (GeometryDrawing, PathGeometry, etc.) are a lightweight version of shapes that have much better performance and lower memory usage but are harder to manipulate. 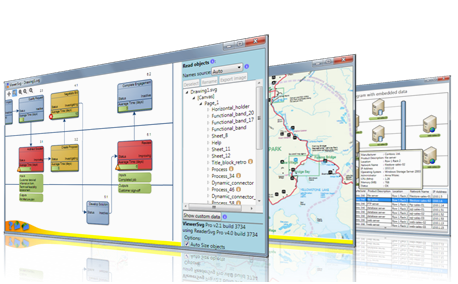 Thereforeg graphics objects are ideal for complex drawings. And what is more the read geometry can be furher optimized for even better performance. Note that Ab2d.ReaderSvg cannot be used in Silverlight applications - but can be used in XBAP Web Browser application. 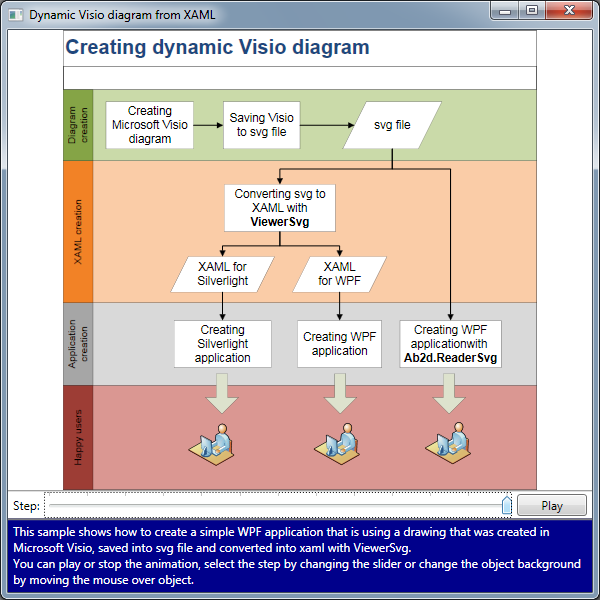 But it is possible to convert svg files into XAML for Silverlight and Windows Store (Windows RT) applications with the ViewerSvg converter. 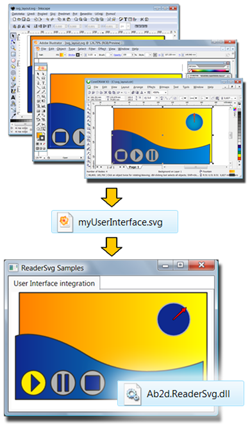 Read svg and svgz (compresses svg) files. 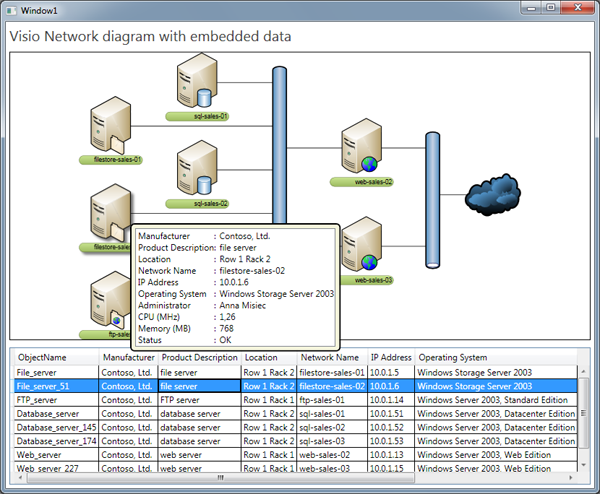 Get name of the objects from id attribute or from title element. Read shapes with their properties. Read linear and radial gradients. Read patterns and convert them into VisualBrush. Read use and symbol elements (also used for embedded fonts). Read elements in svg file as Shapes or as Geometries (better performance). Optimize read Geometry for better performance. Optionally convert text into Path. Automatically resize the read elements. 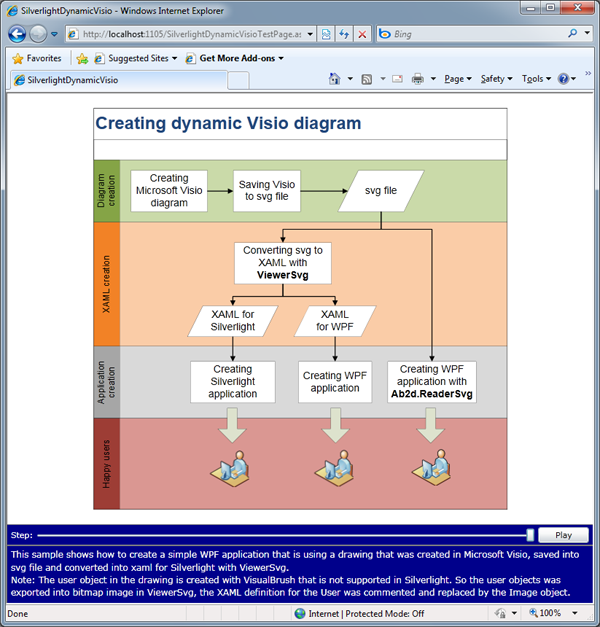 Get progress report when reading svg file. GetXaml method to get formatted and valid XAML of the read objects. 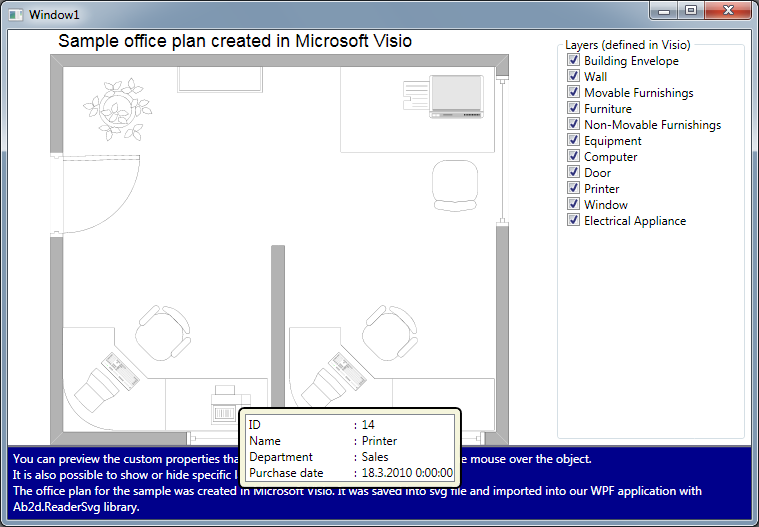 Read custom properties and layers data from svg files created in Microsoft Visio. 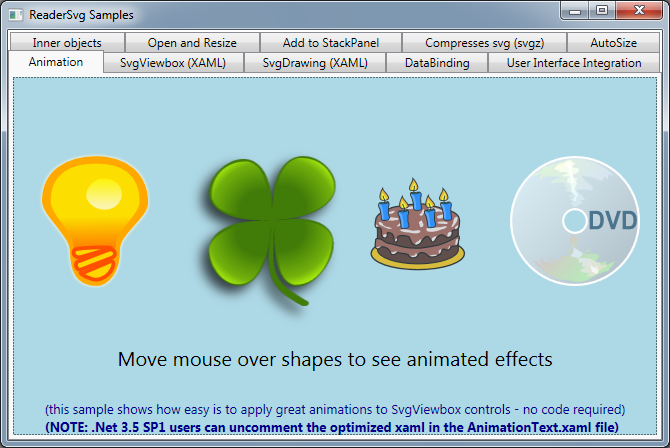 Included SvgViewbox and SvgDrawing controls that can be used in XAML. Optimize hierarchies of read objects with optimizing the groups or completely flattening the hierarchy. True transform transforms the shape data with changing the actual values instead of using RenderTransform or LayoutTransform. The prefered way of storing cliparts in WPF is to use ResourceDictionaries. 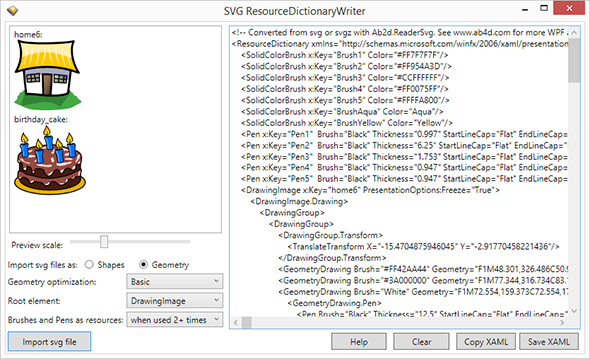 To simplify creating ResourceDictionaries from svg files there is a ResourceDictionaryWriter sample application. It is available with full source code, so it can be fully customized. 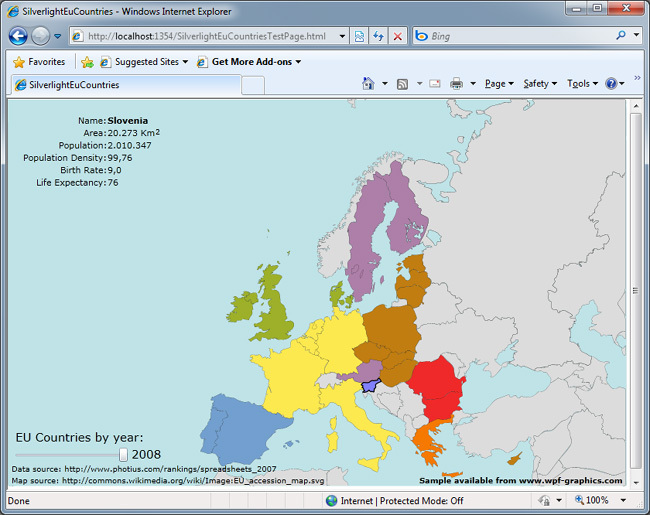 More about usage of ResourceDictionares can be found on the Microsoft's MSDN. Also check out the Links section for links to free online svg libraries and svg editors.